With Hartke's HyDrive series, you get the best of both worlds: the warm tone of traditional paper cones and the clear, punchy attack of aluminum. 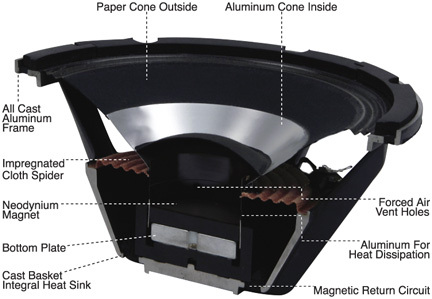 HyDrive's patented Hybrid Cone Technology produces a speaker that uses an outside paper cone to push a warm, deep low frequency and an inner aluminum cone that produces mids and highs that cut, yet still remain sweet. One of the most important advances with the HyDrive speaker is its power-to-weight ratio. A HyDrive speaker weighs 40% less than traditional speakers and handles 500 watts for the highest power-to-weight ratio of any bass speaker available. But the innovation runs even deeper. Because of its cast aluminum frame and neodymium magnets, HyDrive speakers operate cooler and deliver more reliable power handling at peak performance. Expanding on the already inclusive line of HyDrive bass cabinets, Hartke introduces the HyDrive 112, a specially tuned, ported bass cabinet that employs a single 12" neodymium hybrid cone speaker. And to make the HyDrive 112 more accommodating for a variety of settings and playing styles, the speaker has been engineered as a dual-impedance driver, allowing you to switch between 4 and 8Ω impedance levels for additional flexibility. Offering a warm, solid bottom end that’s never too boomy, the HyDrive 112 provides ample power handling in an extremely portable, lightweight enclosure (less than 35 pounds). With its 300 watt driver, this cabinet can bridge the gap between smaller, quieter gigs and big, loud shows. You can even add a second HyDrive 112 for enough power to shake the stage at nearly any venue. Everything about the HyDrive 112 says roadworthy durability: power to spare, steel grille and inset carry handle. The HyDrive 112 is a ported cabinet made from the highest quality plywood with extensive bracing and dado joinery, making it rigid yet lightweight with superior projection and true sonic clarity. The result is a strong, portable bass cab that will withstand heavy gigging while providing a contemporary and stylish aesthetic to any stage or studio.